We are so proud of our very own home-bred stud, Double Grand Champion Glorious Poseidon. 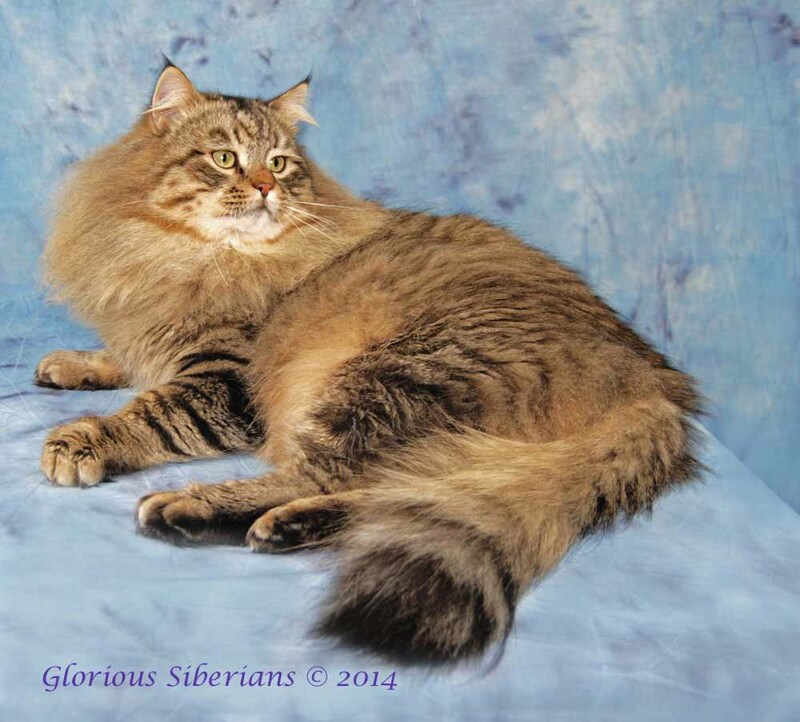 He is TICA 2014 Best Siberian Of The Year, NW Region!! Gorgeous Poseidon demonstrating why Siberians have a triple coat. 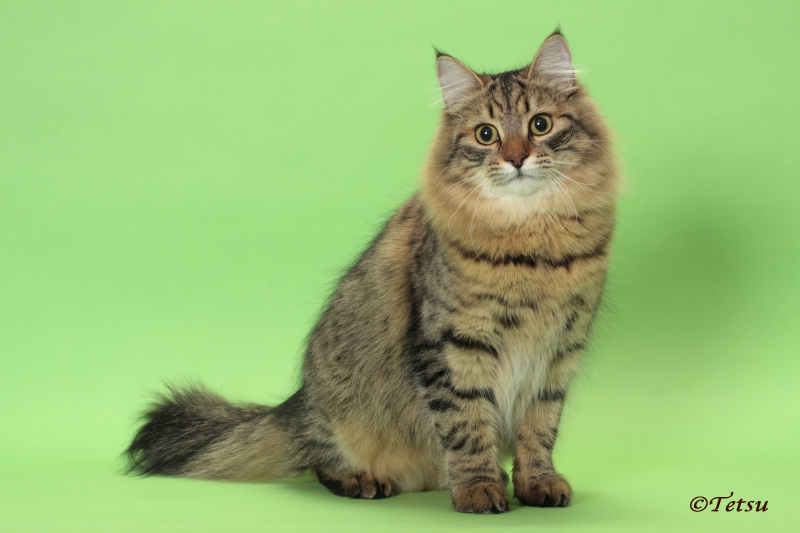 A richly colored black/brown tabby (n 23) Poseidon is a very sweet, cuddly, Siberian at 17 pounds. We are excited by his “classic Siberian” build, coat and heft! 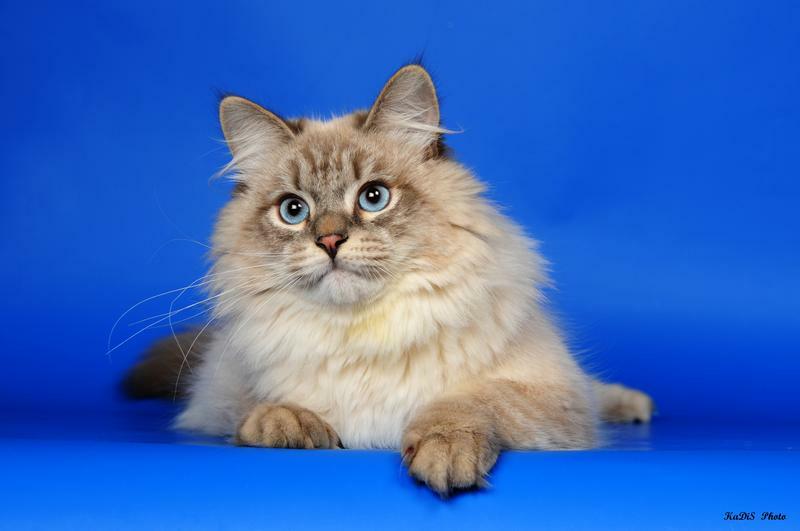 We thank FrostyForest Siberians for the use of their sire, GCH Whitenights Rico, and for selling us our very first Siberian and Poseidon’s mother, FrostyForest Fiona. Through DNA testing, Poseidon does not carry dilute or color point (although he has color point in his lineage). Here Poseidon is being judged by TICA judge, Pamela Barrett, at his first adult showing, age 8 months. 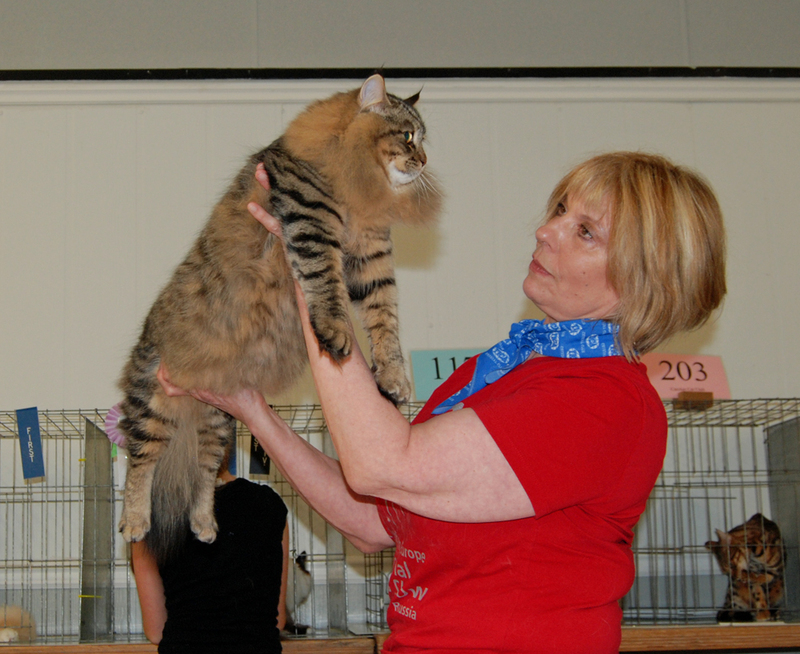 Poseidon won 3rd best long haired cat and 4th best cat of all breeds under judge Steven Savant. 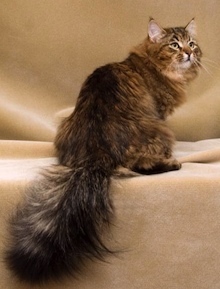 “Nyevsky Masquerade” or Nevas are colored primarily on their face, feet and tails, or the “points of their body.” Color pointed cats can have either solid colored points, or stripes. The rest of their body is a lighter color with a white or cream base. Blue Point cats have gray points, and there can be many more varieties. Color point kittens are born all white or cream color. Their color points gradually appear and slowly spread. As the cat ages the color intensifies and the body color darkens. Glorious Apollo is a gorgeous seal lynx point Siberian and carries dilute. A colorpoint variant of Siberian cats which named Neva Masquerade, and referred to as “Neva” for short. Apollo is a full brother and litter-mate to Poseidon. A social and friendly boy, Apollo is the first to greet us and is the “leader” of our stud cats. 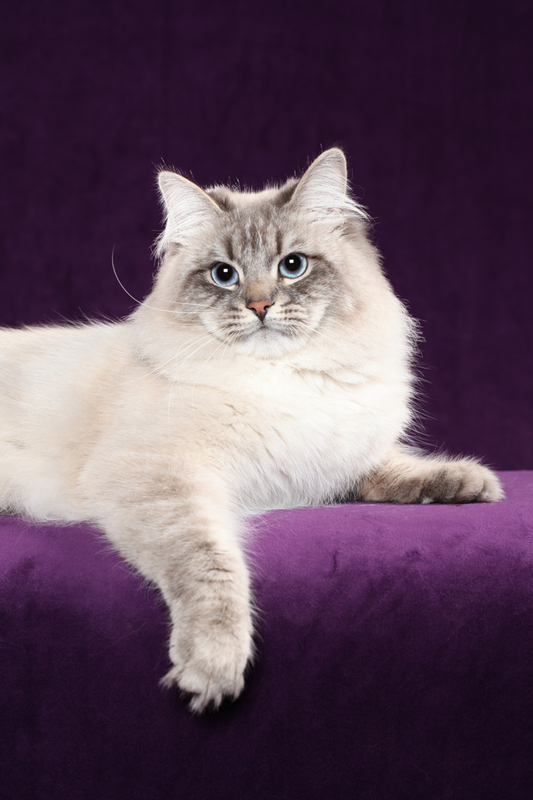 Although Apollo participated in cat shows, his brother Poseidon stole the lime light. By the time Poseidon was retired from showing Apollo had lost interest, preferring his duties at home. 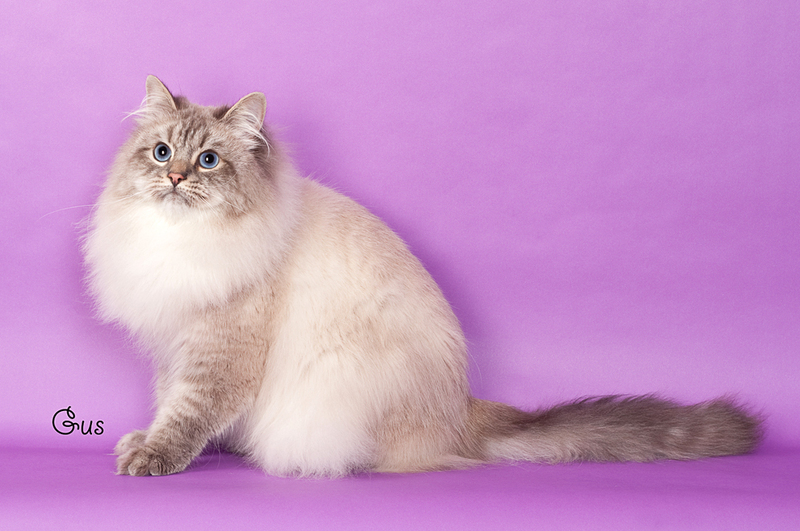 Never the less, he is a very handsome boy and an excellent representative of the Siberian breed! FrostyForest Fiona, at 10 months. 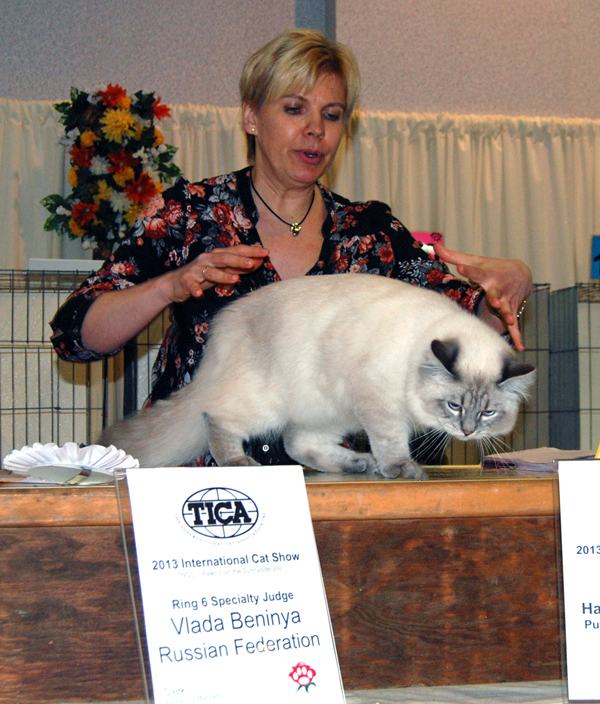 TICA 2014 Best Blue Lynx (Tabby) Point Siberian Of The Year, NW Region! Imported from Moscow Russia, this stud cat is stunning! Zeus is a Triple Grand Champion, blue lynx (as 21 33). 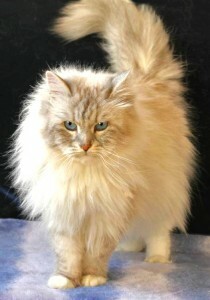 A colorpoint variant of Siberian cats which named Neva Masquerade, and referred to as “Neva” for short. Zeus has a gorgeous face, luxurious coat and excellent boning. He has a kind and gentle nature and loves a good romp. His kittens are beautiful with great personalities. Zeus’ mother is the incredibly beautiful, Champion Formula Uspekha Cassandra. 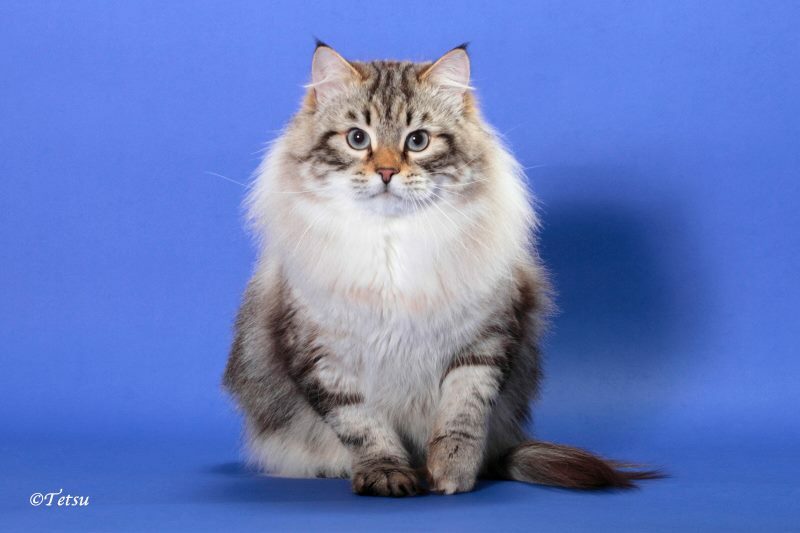 Champion Glorious Neapolitan “Neo” is a warmly colored, brown/black classic tabby (n 22). Our homegrown boy has a sweet and gentle disposition. His father is Amavi Othello and his mother is Glorious Luna. Origins of our foundation stock. 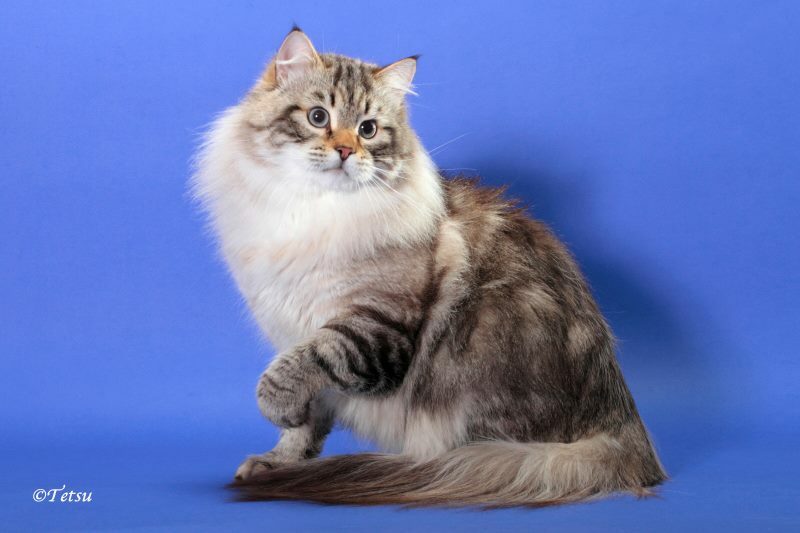 Glorious Siberians are registered with TICA (The International Cat Association) and are eligible to be registered with CFA. 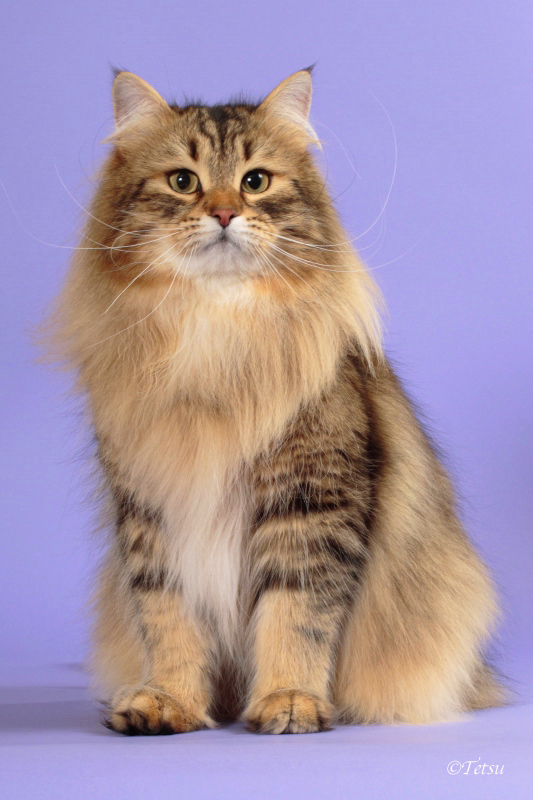 This is part of the Siberian breed standard from TICA and CFA, however, for other registry services, especially those abroad such as WCF (World Cat Federation) or FIFE (Fédération Internationale Féline) color pointed Siberians are called Neva Masquerade and are registered separately from traditional colored Siberians. 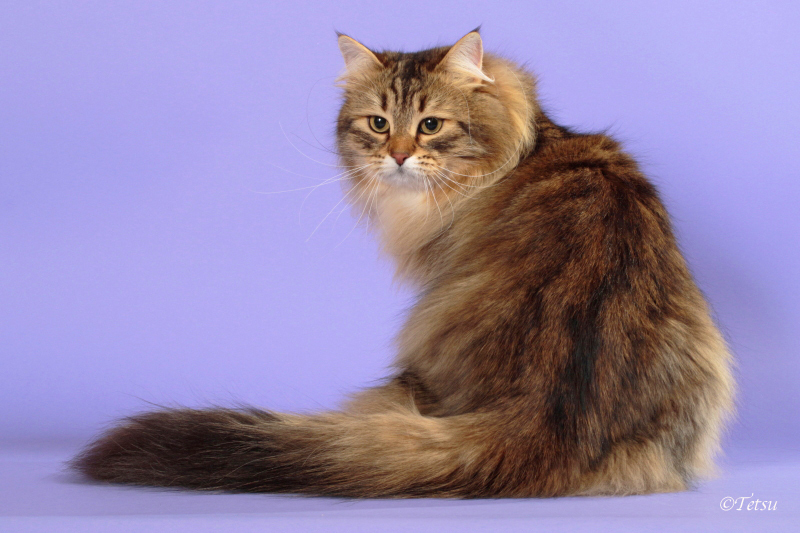 Out of respect for catteries which follow WCF and FIFE’s approach, we note which Glorious Siberians are known color point carriers, and honor agreements we might make to breed traditional to traditional colors only.